Jon usually makes this cake. It’s good, like really good. When we served this as part of a wedding dessert table, it was the one thing on the table that people actively fought to get a slice of. Brides demanded to have one cut for them, we even had a couple once, who had the waitstaff cut two slices, and bring them up to their room, so that they could sit down, and relax at the end of the crazy day, and enjoy their first cheesecake as husband as wife. This may sound extremely, but I dare you to try a slice of this, and let others eat the rest. Preheat oven to 190°C / 375°F. Butter the bottom and sides of a 9" springform pan, and line the base and sides with parchment paper. Place crumbs, butter and sugar into a bowl and stir to combine. You can also use your hands. Press into base of pan and bake for 8-10 minutes, or until slightly browned. Let cool for 20 -30 minutes. Lower oven temperature to 175°C / 350°F. Using an electric mixer, combine cream cheese, sugar and vanilla bean paste in a large bowl. Beat on medium until light and creamy, about 2 minutes. Add flour, and beat to combine. Add eggs, one yolk at a time. Lastly, add sour cream, and beat on medium for one minute. Pour into springform pan, and place foil around the base and sides to protect it. Place in a larger dish or pan, and fill that pan with hot water until it reaches half way up the cheesecake pan. Bake for 45 minutes. Add foil over the top of the cheesecake, not touching it, and bake for an additional 45 minutes. Remove from hot water bath after 10-15 minutes. 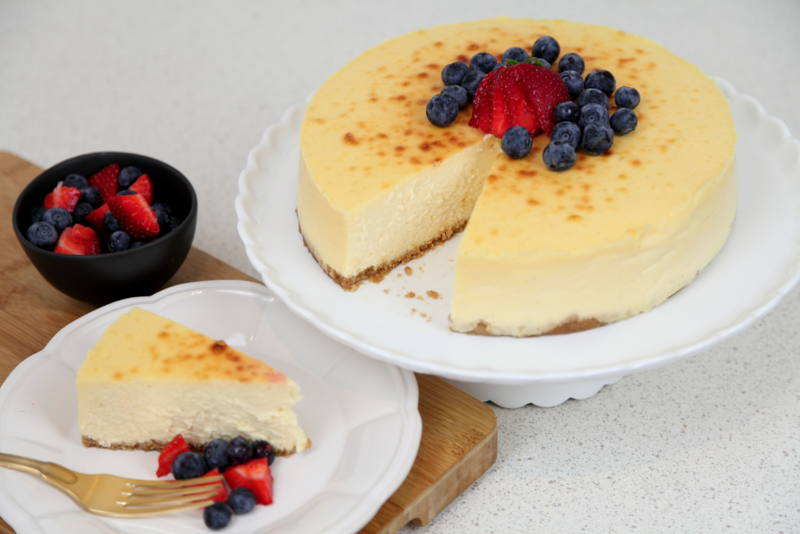 Allow to cool at room temperature, and then place the entire cheesecake pan in the fridge. After 6 hours, or overnight, remove cheesecake from pan and serve. Hi can I halve the recipe and use a 6″ pan? How would that affect the baking time? Yes you could. I would think a half recipe for an hour, but just check it.